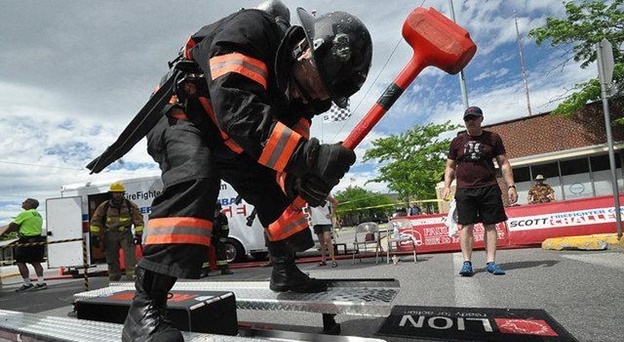 On May 6 to 7 this year, the Branson Firefighters Association and the IAFF Local 152, along with Branson Landing and the Branson Convention & Visitors Bureau will be hosting the SCOTT Firefighter Combat Challenge. This Challenge is one of the most interesting attractions in Branson as it seeks to encourage firefighters demonstrate their skills to the public. The participants wear “full bunker gear” and the Scott 5.5 Air-Pack breathing apparatus. There will be pairs of competitors that will race head to head as they perform real-life firefighting by doing a series of five tasks which include climbing a 5-story tower, chopping, hoisting, dragging hoses and rescuing a life-sized, 175 lb. “victim” as they race against their opponents. In addition to the firefighting competition, there will be another challenge that involves community residents that will also take place on the same course as the pros. There will be kids also who will join the challenge next to the main course located in the south parking lot at Branson Landing. This firefighting event includes SCOTT Firefighter Combat Challenge, Community and Corporate Challenge, Kids Challenge (for ages 4 to 11), Fire Truck Parade, Safety Vendor Fair, plus, LIVE Concert featuring the band, Resurrection – A Journey Tribute. Branson’s Mayor Karen Best said, “We are very excited to welcome the SCOTT Firefighter Combat Challenge to Branson, Missouri.” The mayor added, “Our community embraces those who risk their lives on a daily basis. Hopefully, the heroes participating in the challenge, and all of the spectators, will have a moment to take in the beauty, shows, attractions, shopping and outdoor activities while they are in our area.” Sponsors for the upcoming Firefighting Challenge include Come Alive CrossFit, Cintas Fire Protection, Stormy Point Village, Branson Landing and the Branson Convention & Visitors Bureau. For those who want to know the schedule of events, they can visit BransonLanding.Com. Dubbed as the toughest two minutes in sports challenge, these firefighting attractions in Branson will serve as a regional qualifier for the national championship. Participating firefighters coming from all over central United States will meet in Branson Landing. Resurrection – A Journey Tribute will return to rock Branson Landing on the upcoming Firefighter Combat Challenge Weekend on Saturday on the 7th of May at 8pm. As seen on ESPN for the past decades, the Scott Firefighter Combat Challenge will attract hundreds of U.S. and Canadian municipal fire departments at more than 25 locations and is now expanding overseas including Germany, New Zealand, Chile, Argentina, and South Africa. Before the start of the Firefighting Challenge, participants must be aware that the rules and procedures will be enforced to the fullest extent to provide a level of playing field for all competitors. The organizers of the event reserve the right to make changes, substitutions or fabrications as may be necessary to avoid delays or interruptions to the competition. The Scott Firefighter Combat Challenge which will be held in Branson, Missouri, is a must-see event as it allows you to see participants perform a real-life firefighting.